Ever since the recent launch of Android Wear, most of the buzz surrounding it has been of the upcoming hardware, LG’s G Watch and Motorola’s Moto 360. Almost forgotten is the fact that soon after the Android Wear announcement, a preview SDK was also released for developers. One of the first developers to make use of this is the team behind the read-it-later Pocket service, having launched today a prototype of a service allowing users to save content for later with merely a swipe and a tap. 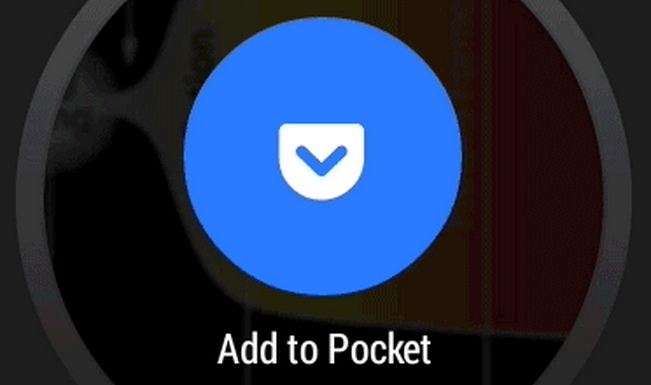 The proposed mini-app will allow users to save to Pocket, but won’t let them view the articles themselves. Much like many of Android Wear’s built-in services, this will initiate a service on your phone rather than on the watch itself. Pocket’s prototype SDK has now been pushed to GitHub for our developer friends out there to implement in their own apps.